The Churchill Theatre continue with their programme of top quality shows and spoiling us bloggers with their latest offering, Blood Brothers. 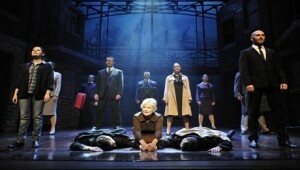 Blood Brothers is one of those musicals that I assume everyone has seen. It ran in the West End from 1988-2012 as well as toured since 1995 therefore there really is no excuse for those who haven’t seen it. Blood Brothers tells the tale of twins separated at birth taking them to the opposite end of the social spectrum. Mickey is brought up by their biological mother and ends up unemployed, followed by a spell in prison. His brother Eddie however is brought up by the wealthy Mrs Lyons and ends up as a local councilor. Despite their mothers efforts the boys forge an unlikely friendship but this isn’t enough to overcome their social status and their untimely fate. There is little left to say about Blood Brothers that hasn’t already been said at some point over the year and whilst there is nothing new or exciting in this production there doesn’t need to be for this show. Blood Brothers is a show that is clearly plot driven unlike a lot of other musicals around. Whilst act 1 is fairly fun with adults playing children for a large part of it act 2 takes a dark turn and makes some poignant observations about society at the time. The Narrator was played by Kristofer Harding and he had a great rock sound to his voice giving the role of the Narrator a nice edge. Lyn Paul played Mrs Johnson. She has played the role on and off over the last 18 years, being voted as the definitive Mrs Johnson (not sure by whom?!). You can tell that this is a role that she loves playing and you truly believe that she loves her sons. Mrs Johnson has to go on a journey from young hopeful mother to be to someone who has seen her son grow up and spend time in prison. Her journey was so convincing that at one point during act 2 I was momentarily convinced that a different actress was now playing the role. Her delivery of the final song ‘Tell Me It’s Not True’ had many around me reaching for the handkerchief. Sean Jones and Joel Benedict played Mickey and Eddie respectively. Like Mrs Johnson they also have to undergo a development from 7 year old children to adults at a differing ends of the social spectrum. Sean Jones in particular has perfect physicality for the part and I easily believed that he was a 7 year old as well as believing he is an adult suffering from chronic depression. 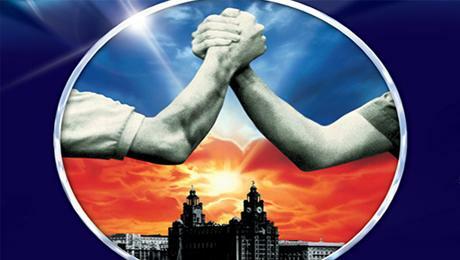 Blood Brothers is a show that every musical lover must see, not only to keep up with the Jones, or the Johnson’s in this case but because it has stood the test of time and repeatedly toured for very good reason. It is a beautifully written show that I wouldn’t be surprised to be reviewing again in 10 years time! To find out more about the show and where it is playing, click here. I saw the performance on the 21st February and it is playing at the Churchill Theatre until 26th February 2016. If you liked my review on Blood Brothers at the Churchill Theatre why not check out my other reviews from The Churchill Theatre including The Perfect Murder, Top Hat & Let It Be.